Sure, we give Toyota a lot of crap for building wildly successful, reliable and boring appliance-cars, but somewhere deep in their organization is a loon with a dream of building insane flying cars. 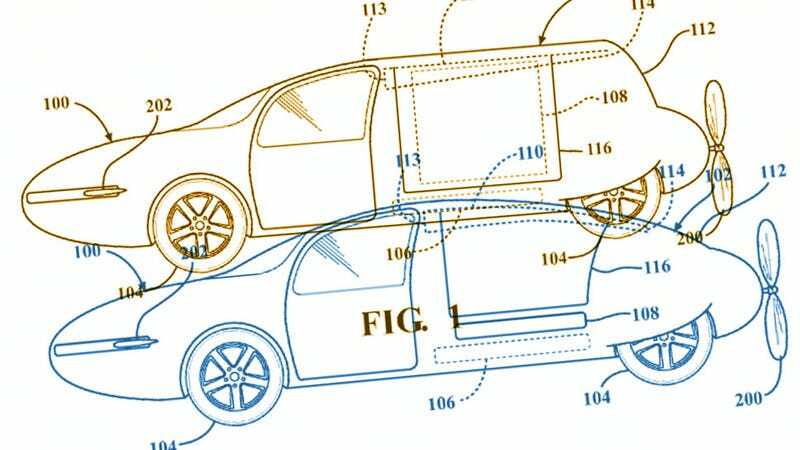 I’m pretty sure this is the case, because this is not the first flying-car patent to come from Toyota’s secretive Kook Division. We even know at least one of the names in Toyota’s Bonkers Flying Prius division: Umesh M. Gandhi. Well, specifically, it’s Gandhi, et al on these two patents, so Dr. (I’m assuming) Gandhi has a team working with him, taking handfuls of pills of expired medications out of strategically placed bowls around the lab and making complex diagrams in CAD software running on a massively parallel array of Commodore PETs. Actually, I can tell you exactly who is working with the bossman on these: for this new one, it’s Taewoo Nam, and for the previous multi-wing one, it’s Robert Roe. So, now we have names for our new heroes. It looks like this morphing transition includes retractable wings, flexible frame members to “contract” the body when in flight mode, and a “tensile skin” to cover it all. That part sort of reminds me of BMW’s striking and vaguely unsettling show car from 2008 called GINA. It looks like hydraulics or possibly “shape memory materials” (like, maybe niobium?) would be used to transition the airphibious car’s shape from land vehicle to sky vehicle. I’m not exactly sure what’s going on at Toyota, but I think the world would be a much more exciting place if Toyota would give Dr. Gandhi and his team full use of the company’s factories and resources for, say, one month out of every year. They’re a huge company, they could totally do it, right? Of course they could. You know, I’m going to see if I can somehow get in touch with Gandhi’s secret Bonkersworks. If I can get past all the panic-eyed PR people, I bet there’d be some fascinating things to see. I’ll keep you updated.